Delta Tau Delta is pleased to announce a return to the University of Texas at Arlington. Fifteen colony members were inducted into the Fraternity on March 3 and the colony continues to grow. Mark Lipnickey (Vanderbilt University, 2016) led the Central Office staff team which included Connor Hollrah (Westminster College, 2015) and Alberto Saenz (Eastern Michigan University, 2016). They began recruiting on campus in February identifying the founding father class of the Epsilon Rho Crescent Colony through referrals from the campus community and interviews with potential new members. “Though the colony is small, the foundation of Epsilon Rho is strong. We believe these 15 men have the resources and drive to build something excellent at UT-Arlington and be leaders in the Fraternal world. With an overwhelming amount of initial support from alumni, these men have the support every new organization needs to succeed,” said Brenden Welch, director of growth. More than three dozen alumni attended a networking event prior to the colonization with a strong showing of Epsilon Rho alumni. Subsequently, a dozen alumni gathered for the colonization ceremony. Fraternity staff also recruited a volunteer advisory team whose members will guide the new Delt colony members as they pursue a charter. The volunteer team includes Epsilon Rho alumni Jeff Harwell (1973), Bruce Orr (1973), John Nowell (1970), Steve Willey (1973) and Randy Beckham (1973). Additional volunteers are always welcome, so anyone living in the area with interest should contact Director of Volunteer Recruitment Bentley Anderson. The University of Texas at Arlington is a growing Carnegie Research-1 “highest research activity” powerhouse committed to life-enhancing discovery, innovative instruction and caring community engagement. With an enrollment of close to 57,000, the University provides more than 180 bachelor’s, master’s, and doctoral degrees in a broad range of disciplines. As of the fall 2016 semester more than 650 students belonged to Interfraternity Council member fraternities. 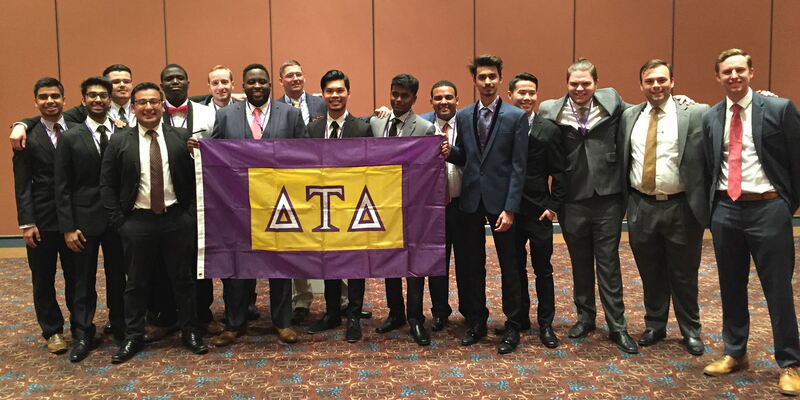 Delta Tau Delta has 137 chapters and colonies in 39 states and the District of Columbia with a membership of more than 9,000 undergraduates and more than 120,000 living members.